Have you ever wondered how shipping containers evolved from plain steel boxes to the wide range of storage, industrial, and living solutions they provide today? 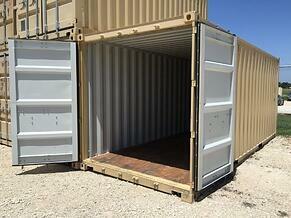 This phenomenon – something we call containerization – was all made possible by American entrepreneur Malcom McLean. Mark Levinson set the stage perfectly in his book, The Box: How the Shipping Container Made the World Smaller and the World Economy Bigger. As Levinson explains, "In 1956, the world was full of small manufacturers selling locally; by the end of the twentieth century, purely local markets for goods of any sort were few and far between." That year, 1956, McLean had one of those light bulb moments. His idea was to enclose goods traded into sturdy containers, which was a major breakthrough for the shipping industry. Essentially, McLean revolutionized the way goods were transported across the globe. The efficiency and standardization of containers that followed eased friction in international trade and reduced the cost to transport goods to the U.S. This system was so widely adopted, that more than 17 million shipping containers are in circulation across the world today. Plus, an entire global infrastructure now exists to move containers from Point A to Point B by ship, truck, train, or airplane. Back in the early 80s, a need arose for secure storage on job sites. Theft was a problem, so three groups of entrepreneurs struck out to find a solution. An east coast group thought storage trailers and retired semi trailers would do the trick. Another group on the west coast considered welding roofs on roll off containers as a possible solution. The container’s built-in durability, relocatability, and ease of set-up could be leveraged seamlessly into a secure storage solution. 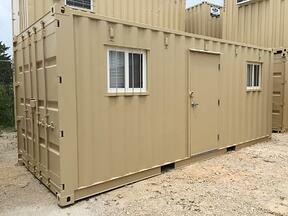 The idea took off and is the predominant solution for job site storage today. In fact, the container storage industry now boasts $2 billion in annual revenue. Fast forward to 2002. Stephen Shang and Brian Dieringer of our very own Falcon Structures, realized there was a need to build safe places for equipment and people on industrial job sites. Believing this market was underserved, the two launched Falcon Storage, a storage container rental business. Eventually, Shang and Dieringer noticed there was an emerging market where containers could be modified and used as building elements. Seeing this approach as the future of containerization, the partners gradually invested more resources in the manufacturing and customization side of their business. In 2015, Shang and Dieringer sold off Falcon’s rental business to focus more of their attention on the manufacturing side and renamed the company Falcon Structures. Today, Falcon and other key players in the industry continue to refine and develop applications for repurposed shipping containers. From more efficient industrial, work, and living solutions to mobile, branded spaces – the sky is the limit in the realm of shipping containers as building elements today. If you would like to learn how a modified shipping container could enhance your portable storage, construction, oil field, military, branding, or living space needs, we can help. Contact Falcon Structures at 877-704-0177 to speak with a friendly sales representative.